iRobot just released three brand new robot vacuums to their lineup. It’s the Roomba i7+ vs. i7 vs. e5. Learn about the similarities, differences, and discover which model is the best for your home. The Roomba i7 is virtually identical to the i7+, with the exception of the self-emptying dust bin. So if this feature isn’t a deal breaker for you, the Roomba i7 makes an excellent runner-up. Lastly, if getting a great deal is more important, the Roomba e5 is still a solid choice. It offers good well-rounded features and cleaning performance in a mid-tier affordable package. You don’t get the self-emptying dust bin or smart mapping, but there is plenty to still like about the e5. Auto-Empty Dust Bin: The Roomba i7+ is the only model that comes with a charging base that automatically empties debris from the robot vacuum after every cleaning. Price: The Roomba i7+ is the most expensive model (with the most features). The Roomba i7 is nearly identical to the i7+, but does not include the advanced self-empty base. The e5 is the most budget conscious option between these three models. Navigation: The Roomba i7 and i7+ have a more advanced navigation system with Imprint Smart Mapping. This allows the models to remember room types, like “Kitchen”, “Bedroom”, or “Living Room”. The Roomba e5 only has memory mapping so it will remember were it has cleaned, but you cannot direct it to clean a specific area. Cleaning Performance: All three of these Roomba’s have top notch cleaning performance. The upside of the i7 and i7+ is how they go about cleaning, versus the e5. 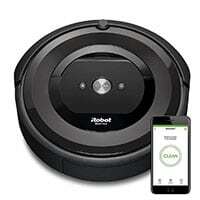 For More: Read our complete Roomba i7+ / i7 review here and read our Roomba e5 review here. The Roomba i7, Roomba i7+, and Roomba e5 are the three newest Roomba models to hit the market. The basic body looks familiar, so what makes these new models different? In terms of design, not a whole lot is different between these three models. Unlike the Roomba 900 Series, the Roomba i7, i7+, and e5 all have a simple overall design. What buttons are on the top? CLEAN: This buttons can start, stop, or pause a cleaning by manually pressing the button. Spot: The spot cleaning feature is useful for cleaning a localized area. In this mode, the Roomba will navigate in small circles around a specific area until it is clean. Home: The Home button will send the Roomba back to home base regardless of where it is in its cleaning cycle. Once at the base, it will charge up and prepare for the next cleaning cycle. What features are on the underside? The underbelly of the Roomba e5, i7, and i7+ all looks nearly identical. The all use an updated dual rubberized brushroll system with a side spinning brush. These pieces, although familiar in design to older Roomba models, have an updated bright green aesthetic and are arguably a little nicer quality than previous versions. Edge sensors around the outside edge of the Roomba help it to “see” hazards like drop zones, stairs, lofted spaces, or other obstacles. AeroVac | The older models of Roomba (like the 690 and 675) used an older style filtration system called AeroVac. This system utilized a bristle style brushroll with a basic HEPA filter. This filter was a little bulkier than the its successor, the AeroForce, but it did get the job done. AeroForce 1.0 | With the 800 and 900 Series, came the AeroForce system. This system used updated rubberized brushrolls to help pull dirt and debris into the dust bin. The AeroForce filter is also smaller (about the size of a personal check) and more efficient than the AeroVac filter. The e5, i7, and i7+ all use the same filter—a new filter, born into the AeroForce family. This new filter is about half the size of original AeroForce filter. This smaller filter allows even more room in the dust bin for actual debris. This system also has a washable dust bin. RELATED – More Roomba Reviews and comparisons here. Regarding weight, the i7 and i7+ are slightly heavier, but only by 2/10ths of a pound. Aside from these parts, there is one key part that separates these comparable models—the charging base. The base on the Roomba e5 is designed for simply charging the robot vacuum. This is the standard base that comes with almost all iRobot robots. The base for the Roomba i7 is the same base as the e5. However, the i7 does come equipped with recharge and resume, so when it runs out of battery it can return to base, charge, and then pickup where it left off cleaning. The base for the Roomba i7+ is also equipped with the recharge and resume feature, however, its charging base is the new smart base. Which also allows the Roomba to empty its own dust bin into the smart base. The Roomba i7 charging base coined the name “Clean Base”. The advanced base of the i7+ does make the price tag go up quite a bit. In fact, the new smart clean basically is effectively the only difference between the i7 and i7+. The i7+ (which we bought and tested) is even marked with a regular i7 model number along the bottom of the robot. The i7 is still compatible with the self-emptying charging base, and user are able to purchase it separately. Are there maintenance costs associated with the Clean Base? When utilizing the Clean Base, you’ll need to purchase the disposable dust bin bags. However, it is not clear to us how long these bags will last. They seem well made, so I would guess at least a year, if not longer. When empty, the dust bag can hold up to 30 loads of debris from the Roomba i7 on-board dust bin. So these models have updated exteriors and some fancy new parts, but what about the down-and-dirty performance of these vacuums? Each of these factors work together to establish the overall cleaning performance. MORE – Check out how Roomba compares to Dyson vacuums. The e5, i7, and i7+ all use the advanced dual rubberized brushrolls. These two rollers rotate in opposite directions, allowing the first roller to agitate debris, while the second roller to drives it into the dust bin. Specially designed grooves in the roller enhance the performance of these brushrolls and allow them to be more effective than previous Roomba brushroll models. The Roomba e5, i7, and i7+ robot vacuums all use the advanced AeroForce filter. This filter is a “2nd generation AeroForce” of sorts.It is about half the size of the original AeroForce filter, without sacrificing any of the performance. As an added bonus, the dust bin that is partnered with this filter is completely washable. This is a feature that is available on all models listed in this comparison (Roomba e5, i7, and i7+). All three of these models come with the same size battery— 1,800 mAh. On the surface this seems backwards. However, given the added suction power of the i7 and i7+ it makes sense that the battery would be under more strain than the Roomba e5. In addition to the longer run time, the Roomba i7 models also have the ability to Recharge & Resume in the middle of a cleaning cycle. This allows the Roomba to clean for 75 minutes, recharge, and then return to the spot where it left off, in order to complete cleaning. It can do this twice, resulting in up to 225 minutes of cleaning time. In terms of cleaning performance, all three of the models are strong contenders. We testing the Roomba i7+ in our Modern Castle testing lab and the results were nothing short of incredible, resulting in 99% cleaning performance across all floor types. This is the best we have seen from any robot vacuum to date. Given the fact the only difference between the Roomba i7+ and Roomba i7 seems to be the smart base, we would expect cleaning performance on the i7 to be identical to the i7+. Regarding the iRobot Roomba e5, the cleaning performance did not stray to far away from the i7+. In fact, the overall cleaning score of the e5 was identical to that of the i7+. On hardwoods, all three models really do an excellent job, each scoring 99% or higher for all debris types. If your home mainly has hardwoods, linoleum, floor tile, or other hard surfaces, you would likely be satisfied with any of these models. Now, regarding low pile carpet. Again, we see excellent cleaning performance from all three models. For high pile carpet, there are similar results—nearly 100% cleaning performance across the board. Sugar was the only debris from each of these robot vacuum that was not picked up 100%. That said, all three of these vacuums were able to lift at last 98% of the sugar from high pile carpet. Control with your smartphone or voice. Wifi-enabled app control is possible on all three of these models by connection with your smartphone or tablet. When you pair up your Roomba to your phone, you are able to start a cleaning, pause or stop a cleaning, view cleaning history, and other various settings. Additionally, the i7+, i7, and e5 can all be voice controlled via Amazon Alexa or Google Assistant. The Roomba e5 uses memory mapping to help it navigate floor plans and remember layouts. With memory mapping, the e5 can remember the position of obstacles, like large furniture, doors, walls, etc. The Roomba i7 and i7+ navigates with a technology called Imprint Smart Mapping. This technology not only allows for digitally drawn maps and footprints, but it also allows you to assign familiar names to particular zones, like Kitchen, Bedroom, or Living Room. Maintenance is another area where there are some notable differences between these models. There are differences in amount of time it takes to maintain as well as associated costs. The Roomba i7, i7+, and e5 each has their own set of advantages and disadvantages to consider when deciding which model may be right for you. In terms of overall value, it’s hard to beat the low price of the Roomba e5. 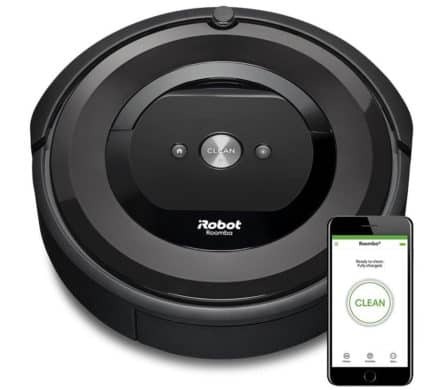 This Roomba was released to appeal to the budget consumer and modeled excellent cleaning performance across all floor types, but does not include some of the more advanced features offered by the i7 and i7+. If you have a lot of carpeted flooring or area rugs, you may find the Roomba i7 to suite your needs better. The i7 Series showed amazing cleaning performance across all floor types and against all debris types. For excellent cleaning performance, while maintaining a solid value, the Roomba i7 is a fantastic option. The Roomba i7+ truly brings it all to the table with unrivaled cleaning performance and a self-emptying dust bin. This takes the user out of the equation and allows you to nearly forget about your vacuum for days weeks (if not months) at a time, without a reduction in cleaning performance. Of course, the filter will still need to be cleaned regularly so it’s not 100% free of regular maintenance, but it is a massive step in the right direction, in terms of self-reliant robot vacuums. Below you’ll find a complete comparison of important specifications on the Roomba i7, i7+, and Roomba e5 robot vacuum models. These models bring many advanced features to the table, but everyone’s needs are different. If you’re looking for a vacuum with excellent cleaning performance that will basically run itself, with little assistant by you, the Roomba i7+ is hard to beat from this lineup. Its cleaning performance is spectacular, as is the near hands off usability. For more information on the Roomba i7+ robot vacuum, check it out at here. If you’re looking for a vacuum with excellent cleaning performance, and don’t mind a little daily interaction, the Roomba i7 is a great option. It lacks the smart base from the i7+, but has all of the same cleaning and features otherwise (for quite a bit less money). 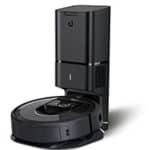 For more information on the Roomba i7 robot vacuum, check it out at here. If you’re looking for a robot vacuum with an excellent value and don’t mind giving up a few bells-and-whistles, the Roomba e5 is a great choice. The e5 offers a cleaning performance on par with the i7 and i7+, but is about half of the price. For more information on the Roomba e5 robot vacuum, check it out at here.